Adux vom Merkureck was a German Police Patrol / Narcotics Dog until 9 years of age. His litter-mates Anouk vom Merkureck and Arko vom Merkureck both passed the Körung and competed in the D.V. Meisterschaft. Anouk is also dam of the vom Merkureck “C, E, F, G” litters (Condor, Fenja, Gini). Adux's parents mirror those of Gero von der Mooreiche in that both their sires are from the von der Weyermühle “A” litter and both of their dams are from the von der Mooreiche “C” litter. Mannix: SchH 3, FH 2, Polizeidiensthund and passed the ZTP with 1A rating for character and SG for conformation. 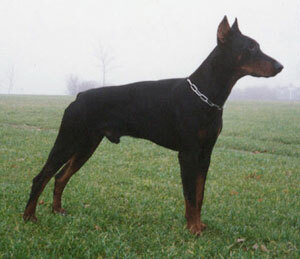 He is sire of the von der Urftquelle “A” litters (Alfred, Apollo). Maiko: SchH 3, DV-DM participant and passed the ZTP with 1A rating for character and SG for conformation. Tyra: SchH 3, DV-DM participant and passed the ZTP with 1A rating for character and G for conformation. Alex: SchH 3 and sire of Ascomannis “C” litter (Falco, Freya) and vom Strundertal “G” litter.